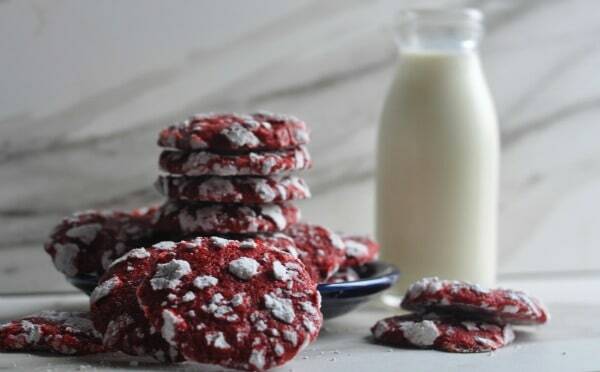 Crispy on the outside and chewy on the inside, these bright Red Velvet Cookies will be the star at your cookie swap and holiday gatherings. 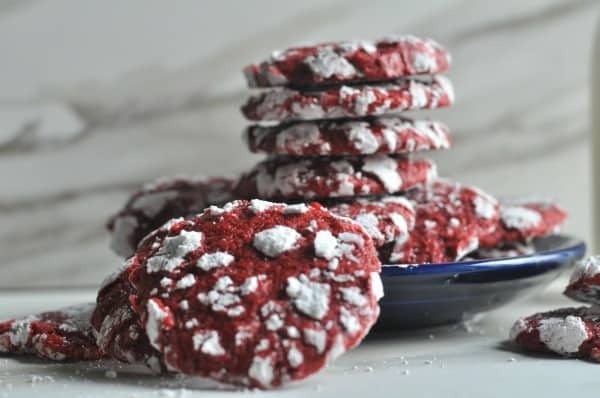 Dusted with powdered sugar, these cookies have the delicious chocolate flavors that everyone loves and expects from Red Velvet. Prepare the cookie dough the day before you plan to bake and the recipe makes plenty to share in cookie swaps or to package for holiday gifts. 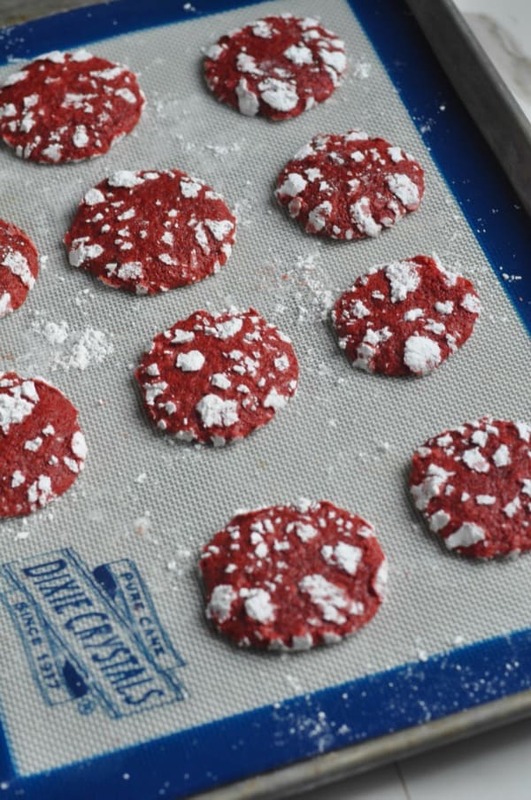 This beautiful bright red cookie will become a new favorite during the holidays. Each year I’m honored when the television show Twin Cities Live asks me to be in their 12 Days of Cookies program. I get super nervous about baking and feel way more confident cooking up a comfort food main dish! 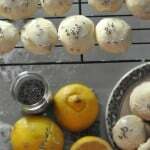 I like to make cookie recipes that are simple, fun and creative. This year I thought it would be fun to make Red Velvet Cookies, I’ve made Red Velvet Cupcakes and knew the base of what makes those cupcakes perfectly red and rich in chocolate flavor. Ghirardelli Sweet Ground Cocoa and Chocolate Extract give the Red Velvet Cookies the rich chocolate flavor you expect. Most baking areas of your grocery stores will carry the Ghirardelli Sweet Ground Cocoa (you can also substitute hot cocoa mix or make a mix of 1/4 cup unsweetened cocoa and 1/2 cup white sugar), the Chocolate Extract is more tricky to find, if you are in the Twin Cities, you can find it at Cooks of Crocus Hill or order online here (affiliate link). 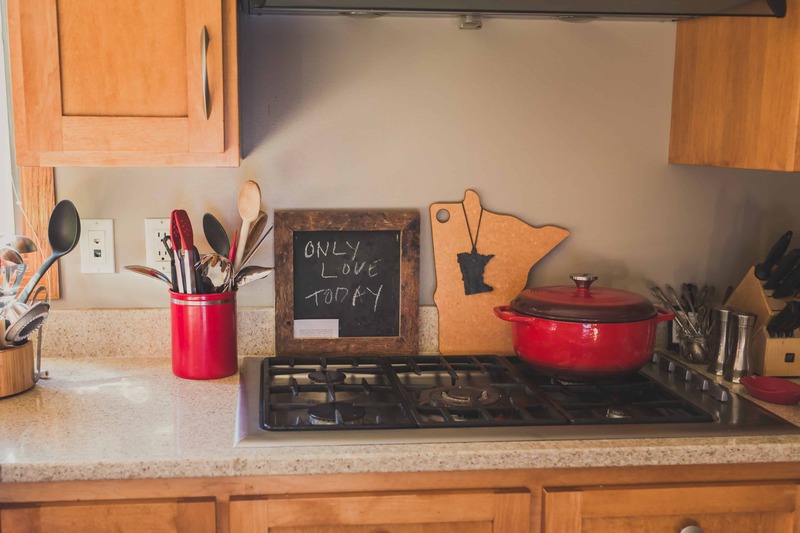 Watch my Twin Cities Live television segments here. 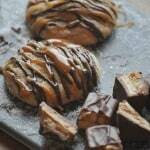 This is the third year that I’ve participated in the Great Food Blogger Cookie Swap. And I thought these beautiful Red Velvet Cookies would be perfect for the swap. The Great Food Blogger Cookie Swap is a great way to get to know other food bloggers from around the country, raise money for Cookies for Kids’ Cancer and try a variety of holiday cookies! 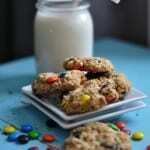 Learn about Cookies for Kids’ Cancer and make a donation. Try the cookies I received in the Great Food Blogger Cookie Swap: Coconut Crinkle Cookies from The Bitter Side of Sweet, Chocolate Caramel Short Bread Cookies from Divine Lifestyle and Orange Hazelnut Ginger Cookies from The Chef Next Door. 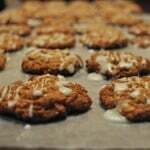 Big thanks to Dixie Crystals, Land O’Lakes and OXO for sponsoring the Great Food Blogger Cookie Swap. Try my 2014 Cookie Swap Cookies: Snickers Surprise Cookies and my 2013 Cookie Swap Cookies: Fruit Cake Cookies. 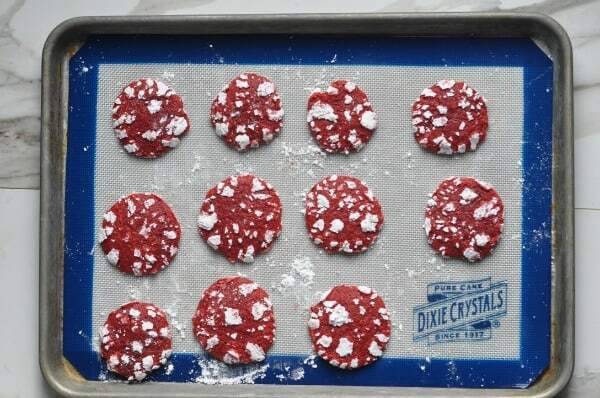 When you are baking these cookies, plan on allowing the dough to chill overnight in the fridge. When you make the batter it will be really sticky so it needs time to chill. Perfect for cookie swaps, holidays or a special gift for someone special! Enjoy! Note: Dough needs to chill in the fridge overnight before baking. In a mixer, combine melted butter, cocoa, sugar and chocolate extract. Then add eggs one at a time. 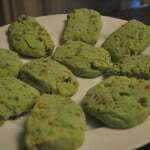 Once mixed, add food coloring. In a separate bowl, add flour and baking powder and mix to combine. Gradually add the flour mixture to the red velvet mixture in the mixer. Put ¾ cup white sugar in a bowl. And then put ¾ cup powdered sugar in another bowl. 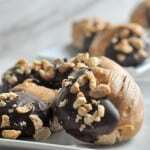 Scoop cookie dough and roll into a small ball. Roll first in the white sugar and then powdered sugar. 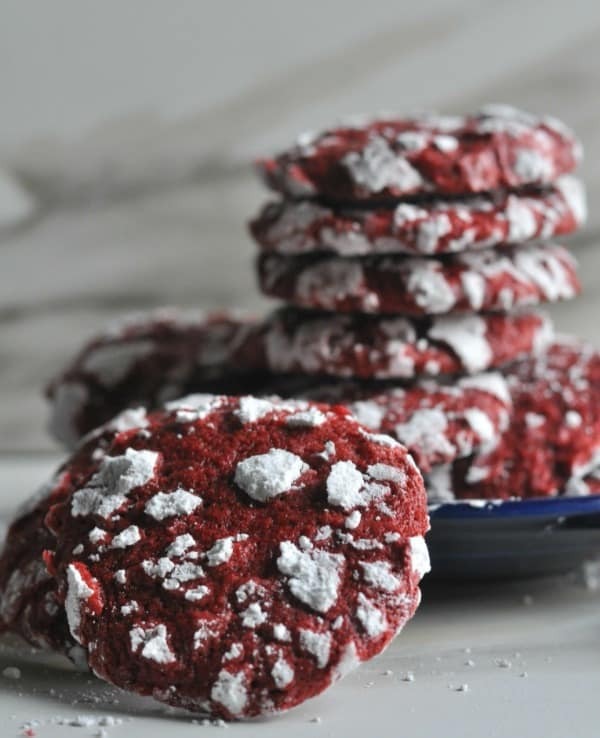 This entry was posted in Desserts and tagged birthday, chocolate, christmas, christmas cookies, cookie swap, cookies, Food Blogger Cookie Swap, holiday cookies, Holidays, red velvet, Valentine's Day by Alice Seuffert. Bookmark the permalink. 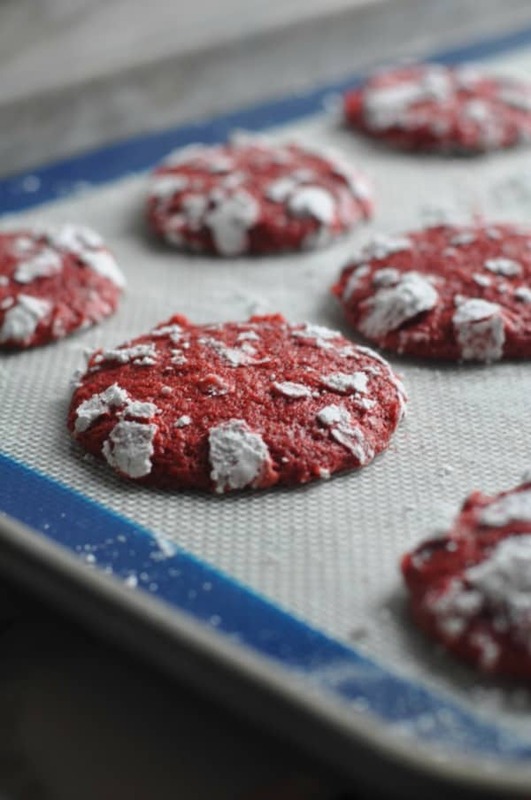 My family goes nuts for Red Velvet Cake, what a great idea to transform them into cookies – these look great! Thanks so much Kelly! Our family loves red velvet too! These looks amazing! I’ll take a dozen! 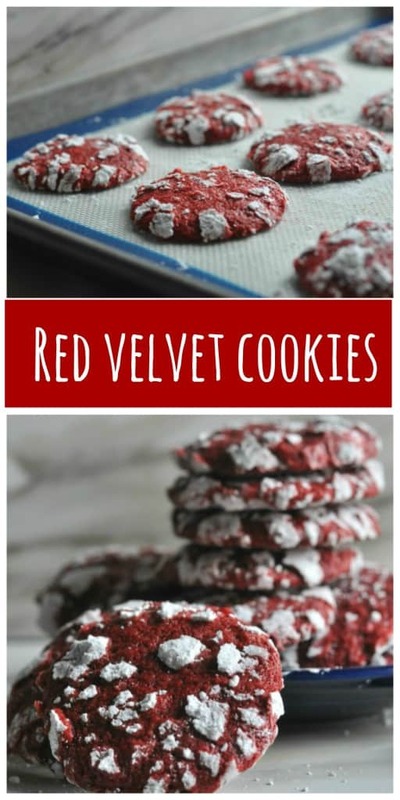 I <3 red velvet cupcakes so I know I will love these cookies!! Cant' wait to give them a try. Thank you for the YUMMY cookies! Happy Holidays! Yum, these sound so good! Perfect for cookie swaps! Thanks Julie! Making some today for a cookie swap! I made these today and mine are flat. Not as puffy as yours were on TCL. Any advice? I tried changing the amount of cooking time slightly and it did not matter. Hi Seth, mine do flatten out especially as the dough sits out and gets to room temp (the butter in the batter is warming). One tip to keep them from spreading as much would be to use the batter right from the fridge and keep putting it back between baking.